GREENSBORO, N.C. (WTVD) -- The ACC announced Sunday they are suspending the officiating crew as well as the replay official and communicator after the Miami at Duke game Saturday night. The game came down to a final play where in dramatic fashion using a series of lateral passes, Miami scored a touchdown. Originally there was a flag on the play against Miami for a block in the back but after a lengthy review, the call was overturned and the touchdown stood. Some viewers also said that one of the Miami players was down when he caught the ball, which would have ended the play as well as the game. Many fans took to social media to criticize what they said was poor officiating against both teams throughout the game. In a statement released on the Atlantic Coast Conference's website, the entire crew will be suspended two games for the "series of errors during the final play of the game." The announcement came after the league's weekly review of game footage which includes reports and interviews with officials and administrators. The replay official erred in not overturning the ruling on the field that the Miami player had released the ball prior to his knee being down. If called, this would have ended the game. The on-field officials erred by failing to penalize Miami for an illegal block in the back at the Miami 16-yard line. If called, the ball would have been placed at the Miami 8-yard line and the game would have been extended for an untimed down. A block in the back foul was called at the Duke 26-yard line. After the officials conferred, which is appropriate, they correctly determined that the block was from the side, which resulted in the flag being picked up. The replay official was not involved in the decision to pick up the flag; however, the referee did not effectively manage communication and properly explain why the flag was picked up. 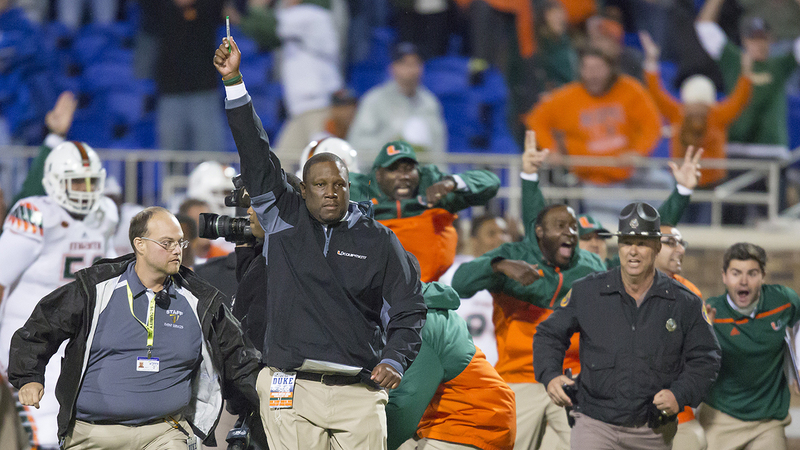 In addition, the on-field crew failed to penalize a Miami player for leaving the bench area and entering the field prior to the end of the play. This foul would not have negated the touchdown because it would have been enforced as a dead ball foul. "The quality of our officiating program is of the highest importance to the league and its schools, and the last play of the game was not handled appropriately," said ACC Commissioner John Swofford. "Officiating is an extraordinarily difficult job but our players, coaches, programs and fans deserve the best that can be offered. We will continue to strive to meet that standard."